The first two items originally appeared on separate pages in the Around Naples Encyclopedia. The first one is a rewrite of the original item on the catacombs. The second item, on the Jewish catacombs, is unchanged. The third item, on alleged Hebrew inscriptions is from May 2015. Romans used both burial and cremation to dispose of human remains. (The upper classes preferred cremation.) Jews, however, in Rome (at least as slaves since the Roman conquest of Jerusalem in 63 BC—see Early Jews in Italy) retained their native method of burial and imitated the rock-burials of their homeland by placing graves in the hard tufa rock around Rome. These sites were extra moenia—outside the city walls. *1 These Jewish tombs are the origin of the Christian catacombs. At its very beginnings, Christianity was seen as a sect of Judaism; hence those Jews who were converted to Christianity by the apostles at Rome were buried with their fellow-countrymen. After a time, Christian converts (not just Jews, but now also native Romans) started to use their own exclusive burial grounds. 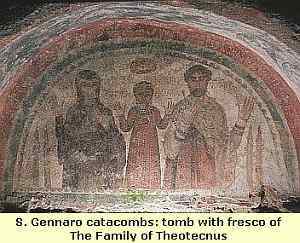 In the course of three hundred years of early Christianity in Rome, some fifty Christian catacombs, large and small, formed a wide circle around the city of Rome, the majority being about half an hour's walk from the city gates. The term "catacombs" is now a general term to describe such ancient underground burial places. Originally, however, the term referred to only one burial site beneath a particular church on the Appian Way in Rome, the church of St. Sebastian, in or near which the bodies of the apostles Peter and Paul were said to have been deposited. The general early Christian name for all such places of burial was koimeterion or coemeterium—place of rest; the term at St. San Sebastian was coemeterium ad catacumbas—the place of rest near the tombs. The term "catacumbas" was used only in reference to that one site. With the rediscovery of the long-forgotten burial sites outside the city of Rome in the late-1500s the "catacumbas" part of the original name was generalized to all such sites including those well beyond Rome—in Naples, on Sicily, Malta and Sardinia, and even in North Africa. In English, "catacombs" was used in that generic sense by the year 1700. The catacombs of San Gennaro became an important Christian religious burial site after the burial there of St. Agrippino (by tradition, the sixth bishop of Naples. He lived in the 3rd century and is venerated in Naples as the first patron saint of the city—that is, before San Gennaro.) The site was then consecrated to Gennaro in the fifth century on the occasion of the entombment of his earthly remains there. At that time, the first place of worship in Naples named for the saint was founded, the Basilica of San Gennaro extra moenia. In 831 the remains of the saint were removed by Longobard invaders to Benevento (and then to Monte Vergine and finally back to the Naples cathedral in the 1400s) and the basilica and adjacent catacombs went into a short period of decline. In 870, however, the Benedictine order started the construction of a large monastery (eventually to become today's hospital of San Gennaro dei Poveri). The monastery continued to use at least the adjacent catacombs for burial for a number of centuries. Also, until the 11th century the catacombs were the burial site of Neapolitan bishops. The catacombs were also used for the disposal of plague victims in the middle ages. Naples, too, had her retrosanti (as did, presumably, all Christian catacombs). Given the strong attachment that Roman Catholic Neapolitans have always felt to their saints—those to whom God has given the power to "intercede" for them—the local manifestation of the retrosanti had a distinct flair. Being buried next to martyrs was a high honor and a sure path to salvation. Neapolitans thus spent a lot of time searching among the catacombs outside the city walls in the early centuries of Christianity in order to find free places near the saints, first near the burial site of St. Agrippinus and then near that of San Gennaro. In the catacombs of San Gennaro there developed a long and narrow corridor known as the "labyrinth" a true retrosanctus filled with hundreds of tombs and coffins; some were simple and unadorned without even inscriptions but privileged and fortunate merely by their proximity to the patron saint of the city, San Gennaro, or other saints, martyrs or bishops of the church interred in the catacombs. They were, after all, friends of God, able to intercede as none other because the saints in heaven were also "present" near their earthly tombs. Hundreds of plain and unadorned tombs thus accumulated near the most revered tomb of San Gennaro and others. Some wealthier persons were fortunate, such as one identified by an inscription only as "matron" who was able to build her tomb almost on top of that of San Gennaro. There are also retrosanti tombs that were marked by name as well as adorned with mosaics. In the upper chambers, there is even a group tomb adorned according to Maltese custom, most likely indicating the origin of a group of pilgrims. There was also what might be called "claim-jumping" in which one person's niche or cubicle was infringed upon by the addition of a newcomer's resting place built into the wall immediately above, giving an entire section of the catacombs of nearby San Gaudioso a two-tiered, bunk-bed effect. Some tombs had marble memorial plaques, some had names simply engraved into the walls, and in the case of those who couldn't read or write, there are mysterious symbols and pseudo-letters scratched in place, perhaps with some personal magical significance. The catacombs of Naples were at their peak after the remains of the martyred San Gennaro were moved there in the early 400s. The catacombs (and thus the custom of the retrosanti) remained active between 500 and 800. *2 The tradition of the retrosanti can be assumed to have thrived in those centuries. Today, the restored parts of the catacombs that one may visit have been cleaned and lighted and do not at all correspond to whatever preconceived macabre image visitors may have. The tombs, themselves, are simply empty rectangles cleanly dug into the sides of walls. Some at ground level are sheltered by arcosolia, arched recesses above the tombs. In many case the section of the wall below the arch and above the tomb is ornamented with a fresco (such as the one shown here). In other words, there is nothing spooky about any of it. In answer to the obvious question, part of the restoration process entailed removing whatever human remains might still have been entombed. Those remains were moved to the Fontanelle ossuary. Now that is a spooky place. This is an aside on the urbanization of that part of Naples that had been the site of Greek and Roman tombs as well as Christian catacombs. The text is from La Linea dei Due Musei, 2001, report issued by the Centro Speleologico Meridionale. Naples. Used by permission. The Romans, who had great respect for the dead, allowed even slaves to have tombs. They considered the zone post murum, beyond the walls, sacred and free from construction. Here they used not only the old Greek tombs but caves as burial grounds. Examples of Roman tombs have been found in the catacombs of San Gennaro as well as in those of San Gaudioso, where you see the columbaria, clearly of Roman manufacture. The culture of the post murum was completely reversed by Christians. The ritual of incubation (sleeping near the dead), already practiced by the Greeks and Romans, was carried to extremes by Christians: praying, sleeping even closer to the deceased (all the better if it was a saint) allowed you to speak with the dead, commune with them in dreams, get advice, answers, be healed...the overpopulation of the city and Christian incubation led first to a state of affairs where more and more Christian tombs were cropping up right next to the tombs of the saints and, then, on those spots, which the Romans had wanted to keep free of construction, convents, basilicas and churches started to go up. Thus, those areas, in turn, became sites of the homes of Christians, who urbanized the sacred Valley of the Dead, giving us the quarters of Vergini, Sanità and Miracoli. Here is a short excerpt from "A Special Day in the Catacombs of Naples" by Selene Salvi. The complete tale is at this link. Everywhere the eye looks there are cubicles, niches, recesses. There are so many of them that we can imagine the oceans of the living that must have flowed through here to visit their loved ones, the way we still do in our own cemeteries. These catacombs underwent a spurt in development when the remains of San Gennaro were moved here from Pozzuoli in the 5th century. (They are now preserved in the Naples Cathedral (and that move took some doing, as well). The remains of St. Agrippino and of a swarm of sainted bishops were also moved to these catacombs. The people wanted a little place near their martyrs, maybe hoping for a good word, some intercession from the afterlife. Tombs of the bishops and of citizens more in view were adorned splendidly by mosaics or frescoes. Their names were written on the walls and entrusted to eternity. When it was all abandoned and completely surrounded by darkness, those painted figures with the large eyes impressed visitors in later times as ghosts “[...] their hands held high, trying to get out of their abyss and fly towards the light of day” (F. Gregorovius, 1853). Today the underground chambers are well-illuminated and Rufina, Heleusinius, Cominia and the tiny Nicatiola, Proculus, Cerula, Bitalia, Marta and Alexander seem to want to welcome and not frighten you. Finally, the guide took us to a cubicle that contained, he said, his favorite fresco. A woman, a little girl and a man peeped out at us from a lunette. [image, above right] You could still read their names and the years they had spent in life on this earth. It was the family of Theotecnus and Ilaritas. They must have been very wealthy. You could see three frescoed layers above them. Their little girl, Nonnosa, died first. She was two-and-a-half years old. The first layer of fresco was for her. Then the father died at age 65; the second layer possibly showed both father and child. Then Ilaritas, at the age of 45, depicted in the dark dress of the widow, went to be with them. The last layer of fresco showed all three, finally together. *2. note: There are confusing comments from various sources as to the general fate of the catacombs after, say, the ninth century. Some say "the catacombs were abandoned..." Partially true...BUT. As is the case in Rome, there was a period starting in the late 1500s of "rediscovery" of catacombs in Naples. (At least, that is when the mention of them in both cities starts appearing in literary sources.) In Naples, however, the "lost catacombs" were almost certainly those of San Gaudioso and San Severo and not San Gennaro since that site was, as noted, in almost continuous use in connection with the adjacent monastery for many centuries. The catacombs of San Gaudioso and San Severe went "missing" after the theft of the remains for San Gennaro from the main catacombs in the 831. To avoid a similar fate, the other two sites were, indeed, abandoned and their relics transferred to within the city walls. —Brown, Peter (1981).The Cult of the Saints: Its Rise and Function in Latin Christianity. University of Chicago Press. —Green, Bernard (2010). Christianity in Rome: The First Three Centuries, p. 188. T&T Clark International. London & New York. —Liccardo, Giovanni (2000). Guida Insolita ai misteri, ai segreti, alle leggende e alle curiosità di Napoli Sotterranea. Newtom & Compton editori, Rome. —Napoli Sacra, Guida alle Chiese della Città. vol. 15. Elio de Rosa editori. 1997. Entries on "Catacombe di San Gennaro" and "La Basilica di San Gennaro" by Giovanni de Pasquale and Rosa Romano, respectively. —Retief, L & L. Chillers. "Burial Customs, the Afterlife and the Pollution of Death in Ancient Greece," in Acta Theologica, vol. 26, no. 2 (2006). Retrieved here. —Waal, A. (1908). "Roman Catacombs." In The Catholic Encyclopedia. New York: Robert Appleton Company. There was a very good article in the New York Times today entitled "In Italian Dust, Signs of a Past Jewish Life," by Andrée Brooks. It was about the excavation of Jewish catacombs in Venosa in Puglia, east of Naples, and also mentioned some of the early Jewish artifacts in the National Museum and National Library of Naples. ...et de suis illos solemnitatibus inquietari denuo non permittat, sed omnes festivitates feriasque suas, sicut hactenus ... tenuerunt, liberam habeant observandi celebrandique licentiam. The catacombs were discovered in 1908, and another find was made in the early 1930s during excavations for a military barracks. Both finds are in the same area, along the street called via Malta, near the intersection of via Lahalle. That is in the eastern part of the city—though well outside of the ancient city of Naples as it existed in the seventh century. It is an area that has undergone intensive construction in the last century: the military barracks, mentioned above, as well as a new elevated roadway leading up from the presumed site of the catacombs to the Naples Tangenziale, the highway that skirts the northern edge of the city. Both sites are described as having been found at about nine feet below the present street level. They both had more than a single tier of tombs; some were covered by a tiled roof. Inscriptions indicate that they are from the fifth or sixth century AD. After the 1931 find, Neapolitan archaeologist, Amedeo Maiuri remarked that they were extremely important in terms of learning about the "early demography of Naples". The bad news is that I couldn't find a trace of them just a few hours ago—I went down there, map in hand. There is a huge barracks overarched by the elevated roadway, mentioned above. I didn't expect a site open to the public the way the Christian catacombs of Naples are (item 1, above), but there wasn't anything, not even an historical marker. I then called up Aldo, a 90-year friend and one of the oldest members of the Jewish community in Naples. He said, "Do you mean the old Jewish cemetery? I know where that is." I said, "No. I mean catacombs from right after the fall of the Roman Empire." He said, "Never heard of them." In any event, the 1931 work uncovered a few tomb epigraphs, nine in all. 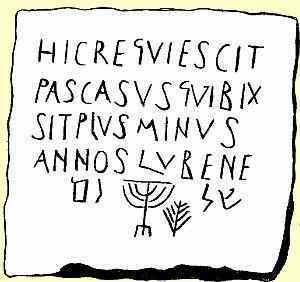 Paleographic studies indicate that they are from the fifth century AD and indicate a consistent Jewish presence in the area of Naples, probably immigrants from the Middle East. The epigraphs are in Latin and not Hebrew letters. 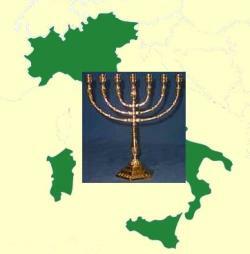 They contained Jewish symbols typical of epigraphs found at other Jewish burial sites in Italy and elsewhere, including the menorah (candelabra) (image right). The epigraphs were the subject of a paper by Elisabetta Serrao, "Nuove iscrizioni da un sepolcreto giudaico di Napoli," (New Inscriptions from a Jewish Burial Site) in Puteoli. Studi di Storia antica, 12-13 (1988-1989), pp. 113-117. Pozzuoli. This is related, in a bizarre way, to the above two items. Giancarlo Lacerenza is currently a professor at the Orientale University of Naples specializing in Hebrew language and literature of the Bible and Middle Ages. In 1999 he published a paper entitled Il "cippo ebraica" nelle catacombe di San Gennaro (Napoli) [The Hebrew Tablet in the Catacombs of San Gennaro (Naples). The tablet is actually a small white cylindrical fragment, 88 cm high (excluding the base), with a diameter of 20-25 cm; that is, not quite a yard high with a diameter of 7 to 8 inches. There are two sets of inscriptions on the column, on opposite sides. The marble cippus bearing a rather cryptic Hebrew inscription in the main catacombs of Naples has been the object of a long debate regarding both its age and the actual authenticity of the epigraph. The monument was first studied by the Austrian orientalist Joself von Hammer-Purgstall in...1832...[who] expressed the view that the inscription had a 'Gnostic' meaning. (...) other attempts were made to explain the text differently. It was considered a record of Christian refugees of Byzantine or the early medieval ages... or a Jewish product of Roman age. Since 1839 it has also been considered as a medieval or early modern forgery. A reexamination of the exisiting literature...definitely allows us to regard the inscription as a forgery, or a joke, originated in the milieu of foreign antiquari and orientalists of early nineteenth century Naples. It appears to be a joke à clef against the theories of the local crudities of the previous century regarding the existence of ancient underground cities in South Italy. The latter were supposed to be of 'Phoenician' or Cimmerian origins on the grounds of the alleged Semitic etymologies of the ancient toponyms.